We are the bees of the Invisible. Passionately, we plunder the honey of the visible, in order to gather it in the great golden hive of the Invisible. These are the words of the poet Rainer Maria Rilke, from a letter to his friend Witold Hulewicz, 1925. Transformed? Yes, for our task is to stamp this provisional, perishing earth into ourselves so deeply, so painfully, so truly, that its being may rise again, invisibly, in us, as spirit. We are the bees of the Invisible. Passionately, we plunder the honey of the visible, in order to gather it in the great golden hive of the Invisible. It struck me that Rilke’s words contained the germ of my entire project. Obviously, as human beings, we have a part to play in the Earth community. But we cannot possibly know what that part is before we know what the human being is. The challenges that we face today—climate change, war in Syria, poverty in the Tenderloin district outside the front door of his building in downtown San Francisco—emerge precisely as symptoms that we have forgotten our role as human beings. When we know how to listen, we can hear in these symptoms the stern voice of angels, admonishing us to remember ourselves—to “know ourselves;” crises speak with the tongues of angels to relay inconvenient truths. One could safely conclude that today, the world is kindly sending choirs of messengers for our edification. This injunction from the Oracle at Delphi is as ancient as history, and never before has it been valued less and needed more. HONEYBEES OF THE INVISIBLE is foremost an attempt to understand this injunction and its meaning for our time. Rilke writes that “We are the Bees of the Invisible.” What is our honey? What is our original gift as human beings? I hope, by the end of this talk, that together we may have lived into the answer. 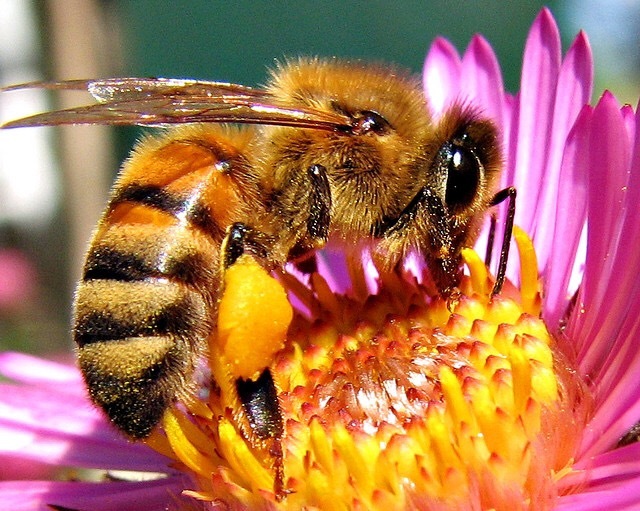 The honeybee gathers seasonal nectar, reciprocally plundering and pollinating the lily, the apple-blossom, the dandelion. These buzzing alchemists of Nature then transmute this seasonal nectar into imperishable liquid gold—the temporary becomes timeless. As Rilke indicates, in this task, human beings can be their disciples. What the honeybee accomplishes in Nature, the human being is to accomplish in Spirit. For the human being, the Great Work consists in the sacred distillation of our worldly experience into its imperishable tincture, which is to say, its spirit, its meaning, its quintessence. The doorway through which fleeting phenomena reënter eternity is in the human soul. Consider the rose-bush in winter: to my outer eye, the rose-bush reveals only a bleak and thorny exterior. In this sense, the rose-bush, and all of Nature, hides its entire past and future in phenomenal enchantment—enchantment in plain sight. But when I know it as a rose-bush, a cluster of grey-brown knotted thorns becomes pregnant with invisible sleeping beauty, a secret promise waiting only for the proper season to unfold its hidden mystery. In this way, the human mind is like a spiritual mirror, in whose reflection a rose-bush becomes the Rose, appearance becomes essence. The outer world provides occasion only for what is fleeting. Nature depends on the theatre of the human soul to provide venue for her eternal aspect. Indeed, it is in this reflection that a transient phenomenon may become a thing of beauty and “a joy forever.” One cannot expect honey from a milking cow, and neither is it to be recommended that one try to milk a honeybee. All creatures perform an irreplaceable task in Nature and no other creature besides the human being provides the outer rose-bush with a sanctuary to reveal its inner aspect—as a symbol of immortal Beauty. The human being is to be the collector of spiritual nectar and the alchemist of invisible honey. Our nectar is outer experience and our honey is inner meaning. Only the human being can behold Nature as a work of art, or as a marvel of incarnate wisdom. This act is to gather the dew of Truth and the nectar of Beauty from the sense-world to return it to the great golden hive of the Invisible. In passing, one may notice that a sip from the cup of this spiritual nectar does not empty the cup, but fills it: “Love multiplies, not divides,” as an old saw expresses this fact. In this way, “extraction of spiritual resources” really has nothing in common with the suggestive associations that this phrase might invite today. Obviously, a survey of the Earth from cosmic space—a view of the oil rigs, skyscrapers, and highway traffic that cover the entire planet— would reveal the trappings of a species more akin to mosquitoes or termites than the honeybees of the Invisible that Rilke describes. Thus the human being, with the highest potential, often falls the lowest and exploits Nature for his own insatiable craving. Other creatures are blameless in this regard. A honeybee does not see in the sunrise the moving image of eternal Truth and Beauty, but neither does it pillage the Earth for meaningless satisfaction of a rapacious instinct for unbridled consumerism. This is really the heart of our challenge today: like the fire of physics, and fire of the sun, the secret fire of Freedom can wreak manifold destruction. Indeed this aspect of fire is precisely what burned our bridge from the Eden of Nature in the first place (and placed at the gates “the Cherubim with a flaming sword”). “The tree,” wrote St. Augustine, “which had brought about the Fall and the loss of Paradise, shall be the instrument of redemption.” Augustine is of course referring to the Genesis Creation story, and tasting from the Tree of Knowledge of Good and Evil. Actually the word in German is Gleichnis, which literally means “likeness.” It is not uncommon to find this word translated in English not as “metaphor,” but as “parable.” Until now, we have considered transient experience as a metaphor, as when we imagined the appearance of the rose and contrasted this to the being of the rose. So while we have first considered how everything transient may become a metaphor for eternal Truth and Beauty, here we can consider everything transient as a parable to teach us Goodness. Everything in the world is fleeting, and the soil to sustain new life is provided only by the continual dying of the old. Everything offers itself to be trodden under foot, and we live only by the grace of Nature’s loving sacrifice. In this way, all of life becomes a parable to teach us Goodness, selflessness, Love. Love in Saint Paul’s meaning is a question of relationship, and it is a question of a specific quality of relationship: namely, relating to another on his or her own terms rather than through the glass of our own self-concern. Love is the one thing that cannot be possessed; love is gained only in the giving it away. In this way it is the only antidote to materialism. To meet one another “face-to-face” is, perhaps, a distant ideal, but it strikes me that it may be the most important ideal in the world today. I wrote most of the content of this book in the months leading up to the Presidential Election in November. During that time, it became more obvious every day that we never meet one another face to face, but only through the reflection of labels, prejudices, and preconceptions, which is to say, “through a glass, darkly.” This book was an attempt to understand and to overcome this fragmentation. Let us again invite the image of the rose-bush into our mind’s eye and then inquire: Where is the flower in January? It’s nowhere in manifest space—this is precisely the point. Instead, the rose in full flower hovers outside of space, as an idea, a potential waiting to be born. This incarnation into space and time depends on the necessary conditions of spring rains and summer sun, the marriage of water and fire. If the rose should bloom, the sun and the rain did not cause the rose to bloom. They were, however, necessary conditions for its appearance. The true and final cause was the spiritual germ, the Lógos, the Invisible Idea, only waiting for the proper season to be made manifest. the sunlight of Freedom with the rain of understanding. My inspiration behind these books and behind this talk today is to offer my small contribution towards this Great Work of humankind on the Earth.